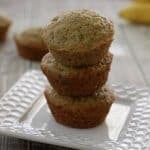 I originally posted the recipe for these Easy Whole Wheat Banana Muffins about 3 1/2 years ago and it’s still a family favorite. 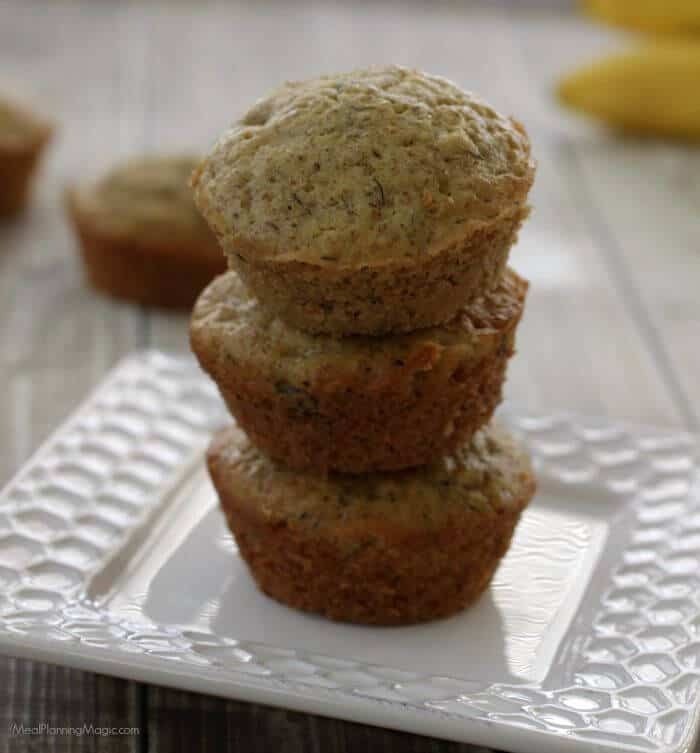 It’s a pretty safe bet to say it is my son’s favorite muffin that I make! But since I originally started making them I’ve made a few tweaks to “health-ify” them. 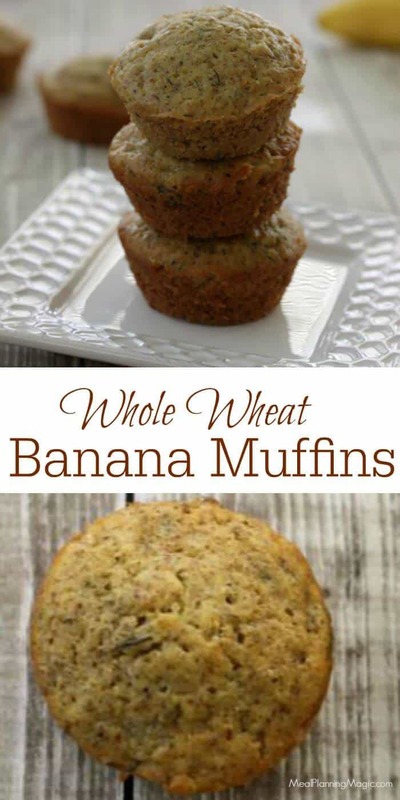 I’ve added whole wheat flour, reduced the amount of sugar and increased the amount of bananas (more natural sweetener). The results are just as delicious as ever! The original recipe calls for nuts in the batter but my family does not like nuts in baked goods (except for me!) so I left them out. I love to make up a batch of these and since they make plenty, they are great for stashing extras in the freezer. Just warm up and serve on busy weekday mornings with some yogurt or bacon and fresh fruit on the side. So easy! My kids even like to have them for snacks—yum! I hope you’ll give them a try! 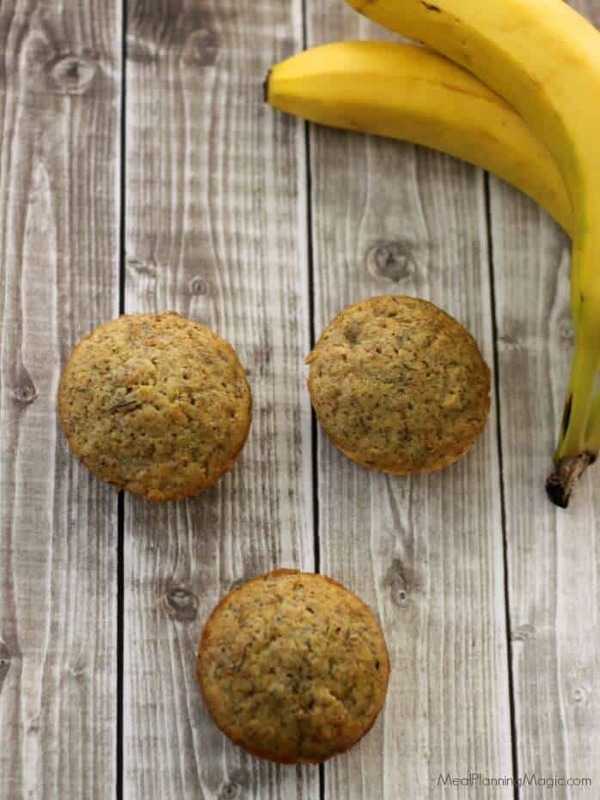 Filled with banana goodness, these Easy Whole Wheat Banana Muffins are a family favorite! 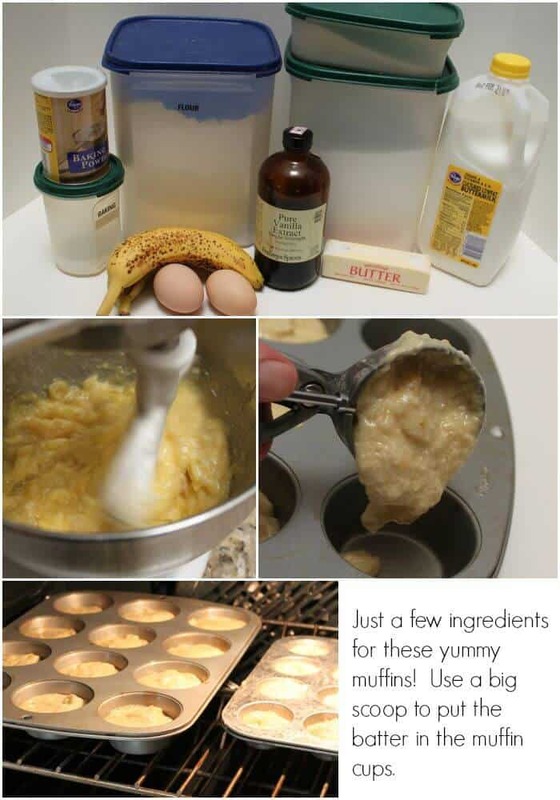 Preheat oven to 400º F. Grease 12 standard size muffin pan cups or use paper liners. Beat together butter and sugar at medium speed until light and fluffy. Add eggs, 1 at a time, beating well after each addition. Beat in bananas until smooth. Mix together flour, salt, baking powder, and baking soda. Stir in nuts and vanilla. Do not overmix batter; it should into be completely smooth. Spoon batter into prepared pan, filling two-thirds full. Bake until lightly golden, 15 to 18 minutes. Transfer muffin-pan cups to a wire rack to cool slightly. Turn out onto rack. Serve warm. I almost always get at least 15 muffins if not the whole 18. 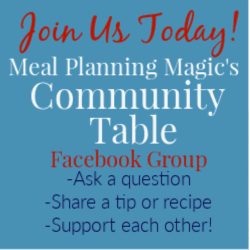 Depends on the size of your muffin tin and how full you fill them!